Disclaimer: The links found below are affiliate links, and at no cost to you, I will earn a small commission if you click and/or make a purchase. At first I was unsure on how well the design would work. Would it fit the way I imagined? Would I love it when it's done? I had all the questions running a mile a minute in my mind, but that didn’t deter me. I kept going. And the more I kept crocheting, the better it started to turn out, and the more excited I became. Every chance I got to try it on, I did a little dance. This was going to be a good one. I wanted this sweater to be a little over-sized and cropped. I decided on a wide neck because with Spring approaching, I knew I would want something I could wear alone. A statement piece perhaps. Wearing it off the shoulder added the sassiness. The honeycombs made it edgy. The over-sized design gave me the “I’m so cool” feeling. And last but not least, throw on a pair of heels (or not) with this baby and paint the town with a classy look! Ready to make your very own Winterberry Sweater? 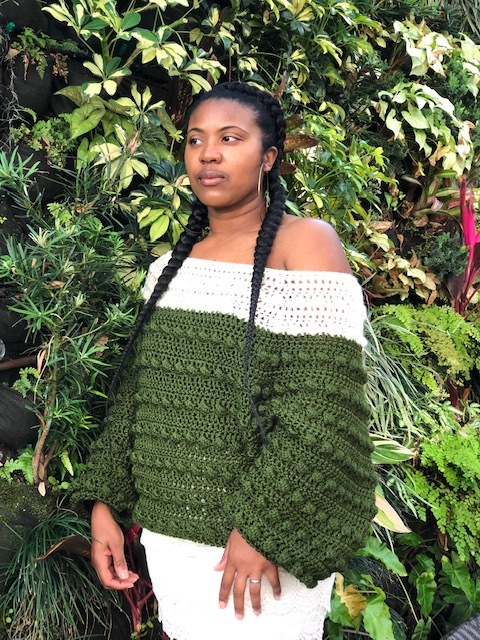 Purchase the crochet pattern here. Would you like one made by the designer? Purchase the Winterberry Sweater here. I’d also like to give special thanks to my pattern testers, who did an awesome job testing the Winterberry Sweater. Keep reading to see their beautiful work!